St. John’s College, Jaffna shone in the Jaffna District Badminton Individual Championship 2013 finals organized by the Jaffna District Badminton Association and played in the indoor courts of the Peto Memorial Hall, St. John’s College, Jaffna. St. John’s walked away with the under 19 and under 15 championships. Their ‘B’ teams which took part in all the age groups, finished runners up in the five groups. Jaffna Central were the other school that did creditably. They annexed the under 17 and under 13 titles. 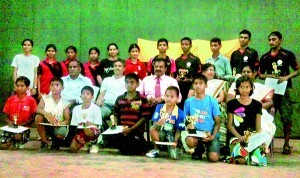 Uduvil Girls’ College (Boys) won the under 11 tourney.